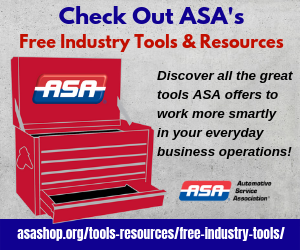 ASA-Illinois shop receives small-business award - AutoInc. Clark’s Car Care, an ASA member-shop in Naperville, Ill., recently received a monetary fist-bump for its community support activities. Synchrony Financial, one of ASA’s Sponsored Benefit Providers, named Clark’s to its list of 2018 “Working Forward” Small Business Award winners. Clark’s is one of 10 winners of the 2018 award, each receiving the same amount of money for the same sort of purpose. The award grants Clark’s $10,000 to use for business growth and another $10,000 for the family-owned shop to pass along to a local charity that aligns with its mission and values. According to Matt Weber, co-owner of Clark’s, the shop intends to use its portion of the award to further its technician training and the additional amount as a donation to Care for Cars, a DuPage County, Ill., organization that serves as a resource for people struggling to get to their jobs or job interviews due to transportation issues. It was founded in 2012 by John Tartaglione.